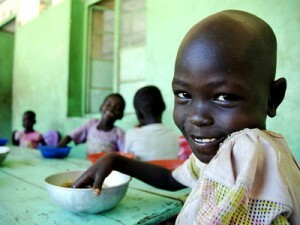 Children have lunch at an Orphanage in Juba, Sudan. Photo: Arpan Munier/ UN Photo. Ten years ago, world leaders set ambitious targets for reducing poverty and improving social and economic conditions around the globe by 2015. Progress toward achieving the eight Millennium Development Goals has been impressive, despite the many challenges posed by conflict, climate change and financial calamities. World leaders are gathering again this year to map out the homestretch of this momentous campaign. The Sept. 20-22 United Nations Millennium Development Goals Summit in New York promises to revitalize and refocus the international community on proven strategies for eliminating hunger, reducing poverty and boosting labor. This is a unique opportunity for those on the front lines of the global fight against poverty to tell policymakers what is going on in the field – which approaches have proven successful, and which challenges remain. In the coming weeks, the United Nations Foundation and Devex will invite contributions on each of the Millennium Development Goals, one at a time. The debate will span a variety of topics from environmental sustainability to maternal health and universal education. The debate begins right here, right now – on Goal 1: to eradicate extreme poverty and hunger. The target is to halve, between 1990 and 2015, the proportion of people who suffer from hunger and whose income is less than $1 per day, and to achieve full and decent work for all. The international development community plays a critical role in achieving these targets, through initiatives large and small. Tell us how your work is helping to eradicate extreme poverty and hunger. Your experience and knowledge is key to one of the most important initiatives of our time. This entry was posted on Thursday, May 20th, 2010 at 12:37 am	and is filed under Goal 1: Eradicate extreme poverty and hunger. You can follow any responses to this entry through the RSS 2.0 feed. You can leave a response, or trackback from your own site.